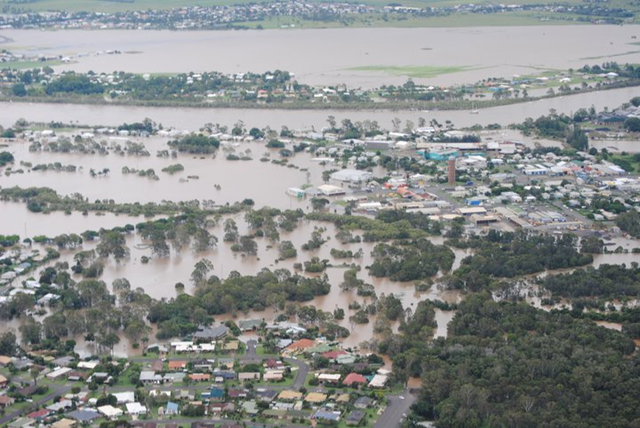 Why does God allow floods to devastate Australia? Why does God allow such devastation as we are seeing in Queensland with Cyclone Marcia through central Queensland (ABC News, 23 February 2015) and the floods of December 2010 – January 2011? 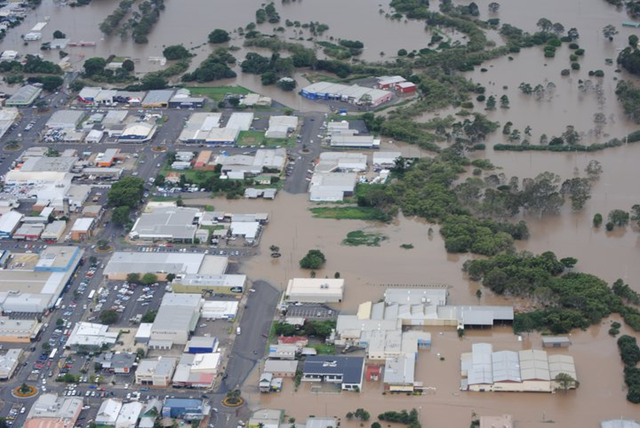 Here are some photos of the flood devastation in Queensland from the Bundaberg News-Mail. MOTHER nature has unleashed its fury in the state’s north with 18 rivers expected to break their banks by tomorrow night as the Queensland floodwaters run south. The Queensland floods are hurting the nation’s Gross Domestic Product (GDP) by wiping as much as $9 billion off export revenues. Operations at at least 40 coal mines in central Queensland’s Bowen Basin have been disrupted because of the floods, crops have been damaged and grazing lands are under water. The state is responsible for more than half of Australia’s coal exports, 45 per cent of meat and a quarter of fresh food exports. Royal Bank of Canada (RBC) senior strategist Sue Trinh says the economic impact of the floods could be the biggest of all the natural disasters Australia has experienced. “I hope the Aussies die! This is curse of our Hindu Gods”. “EVERY now and again Mother Nature likes to make the point that she has slightly more influence than any self-declared masters (or mistresses) of the financial universe”. Who sends the rains? Is it “mother nature” or God Himself? God is very clear about telling us in the Christian Scriptures. This raises the theological issue of theodicy – a defence of the goodness and omnipotence of God in the midst of evil. God sends rain on the just and the unjust (Matt. 5:45). There is the problem of evil and disaster that originated in Genesis 3 with Adam and Eve and the fall into sin. All of creation is suffering from this disobedience. Are flood disasters the outcome of evil in our world? Does God send the cyclones, tornadoes and typhoons to remind us of judgment to come? God sends the rain, but human beings in their desire for prosperity (or greed), cluster around rivers and build houses in low-lying areas. Could it be that God sends the rain and human beings create the human conditions so that floods devastate? Though not theologically satisfying, I think this is a huge part of the problem. When you build on a flood plain you can expect to be flooded out from time to time. Smart people don’t build in flood plains. Smart insurance companies charge a mighty premium to insure anything in a flood plain. Smart governments do not zone flood plains for residential or commercial industrial purposes. But people still build there, and insurance is cheap backed by the government, and the snow melts and the rain comes. Floods are often classified as hundred year floods, or five hundred year floods, or thousand year floods. Somehow the hundred year floods are now commonplace and I’ve seen some five hundred year floods and a thousand year flood. Pretty good for being only a little over half a century old myself. I’m pretty sure the cause of these ‘rare’ floods is that marshes have been drained, farms have been turned into malls with massive parking lots, and every house has a paved driveway and a sidewalk. The water has to go somewhere. The marsh that once held the surplus is no longer there. The water flows downstream. Each upstream city or town or hamlet puts up a levee to protect itself from the flood, pushing the water downstream faster. Who’s to blame? Farmers want higher yield on more acres, so they install drainage ditches. Not so much now as this unsustainable practice now has legal roadblocks that restrict drainage a bit. But almost everything built in the past 100 years has been done at the expense of natural habitat that would soak up considerable water. We have inadvertently engineered floods to be worse than ever. A flood from 100 years ago could still be quite an event. But now it’s a human made problem. New Orleans was an inevitability. Big floods down the Mississippi this spring are another inevitability. Fargo, on the Red River (which runs North into Canada) looks like it will also an inevitability. At least Fargo is looking at a solution of diverting the river into areas where it has more space to spread out. And they have forbidden rebuilding in many parts of the city. Fargo downtown flooded out a few years back and most of it burned when electrical fires started and spread uncontrollably. Crazy city, but at least they are looking for higher ground AND looking to let the river expand as it wants to, and the government is trying to force the reversal of many old drainage ditches. This are is vital because it is prime wheat growing land that feeds hundreds of millions of people. The wake up calls have been given. Some people are actually waking up. Rain needs to soak in, and the little bits of excess need to go downstream. We screwed that up and it’s time to fix that before we see too many more thousand year floods. Theologically, God makes the rain to fall on the good and the evil, but the evil have not been good stewards of the land, causing misery and pain and death. Had we been good, we would have farmed with nature, not against nature, and we would not be blaming God for terrible floods. Perhaps it would be more to the point to ask why people insist on building cities on flood plains. San Francisco was destroyed by a massive earthquake because it is built on a major earthquake fault. So they rebuilt it on the major earthquake fault. People build homes along the Russian River north of San Francisco. About every 5-7 years their homes are destroyed by floods. They rebuild. I have a friend who lives in the Florida Keys. The houses there have no ground floor because when huricanes come through they would be flooded. The first floor is 12 feet in the air resting on stilts. People know the dangers of the places where they build cities and they choose to rebuild them after they are destroyed by “natural disasters” which, having happened once, should be sufficient data to decide to move somewhere else. I remember when my wife and I lost all that we owned in the Brisbane flood of 1974. I was in theological college and we were living in our caravan (called a trailer in North American lingo), 20 feet long on the banks of the Brisbane River at Graceville, a western Brisbane suburb, where the College was located. The entire college was located in a very low-lying area on the river bank and was devastated. As a result, we lost car and caravan which were parked alongside the College. But it was because of our stupidity of having a caravan and car in a flood-prone zone that we lost it. Never again have we built or located near a flood zone. “How terrible it will be for pregnant women and for nursing mothers in those days. For there will be disaster in the land and great anger against this people. They will be killed by the sword or sent away as captives to all the nations of the world. And Jerusalem will be trampled down by the Gentiles until the period of the Gentiles comes to an end. Then he gave them this illustration: “Notice the fig tree, or any other tree. When the leaves come out, you know without being told that summer is near” (New Living Translation). 5. Does God send judgment to people and nations in this life because of the sinfulness of humanity in those nations? What happened in Noah’s day? The description was that “the earth was corrupt in God’s sight, and the earth was filled with violence” (Gen. 6:11 ESV). When God saw this corruption, he told Noah, “I have determined to make an end of all flesh, for the earth is filled with violence through them. Behold, I will destroy them with the earth” (Gen. 6:13). God’s judgment happened in this life because of the corruption of humanity in Noah’s time. Why should God think any differently of Haiti’s earthquake or Australia’s floods? What have these countries done to promote sinfulness and corruption? I think there is enough biblical evidence to support God’s judgment of people and nations. 6. Tragedy may cause us to re-evaluate priorities. Do not store up for yourselves treasures on earth, where moths and vermin destroy, and where thieves break in and steal. But store up for yourselves treasures in heaven, where moths and vermin do not destroy, and where thieves do not break in and steal. For where your treasure is, there your heart will be also (Matt. 6:19-21 NIV). 7. There are reasons why God allows Christians to suffer. If the world hates you, keep in mind that it hated me first. If you belonged to the world, it would love you as its own. As it is, you do not belong to the world, but I have chosen you out of the world. That is why the world hates you (John 15:18-19 NIV). As a personal example, when I was a child at age 6, 10 and 12, I suffered 3 bouts of rheumatic fever that left me with a leaking mitral heart valve. Since 1983 I have had five open-heart surgeries (1983, 1987, 1988, 2003, 2013) to insert mechanical valves to correct this abnormality. To my knowledge, the rheumatic fever was not caused by my personal sin, but is a consequence for my being born in sin as a result of Adam & Eve’s fall into sin (Genesis 3). 8. Does the Book of Job shed some light? I think that the book of Job gives us the best answer to the question, that is, We Do Not Know, but God does know what He is going on about, and we should be silent before Him in worship, wonder, and praise. That God has ordained the weather to be what it is is true, there are no things outside His loving providence and thus we can be confident even when all around us fails, as Habakkuk noted, no mad molecule, no runaway nature, He does have the whole world in His hands, and He holds us, and holds us dear. [Hab. 3:17-19]. That sin has entered the world is true, though how it effects such things I think is more indirect, for while all nature groans in an effect of sin how this is so is not revealed to us, Rom. 8:18-22. One aspect of sin in the world is the lack of wisdom that builds things on flood plains or in denial of the common droughts of an area, and then wonders why we have wet or dry weather as usual. We build below sea level and wonder why things get wet at times. Another reason can be divine judgment and blessing on a society, though here we are told not to be hasty and judge by appearances, for we don’t know all in any case, Luke 13:4. Here we need to avoid the twin errors or naturalism, an impersonal cosmos, on one hand, and moralism, or a world of simplistic this for that, on the other. The world is not a mechanical system but a system of mechanisms that is open to the personal providence of God and directed toward the ends He has appointed for all things. I think all talk of ‘mother nature’ is foolish, for nature does not do anything, that is, act on choices it makes, but it only happens in accord with its construction and direction. I agree that the Book of Job causes us who believe in the sovereign Lord to say that we do not know the answers for the Haiti earthquake, the Pike River mine disaster in New Zealand and the floods in Australia. You and I can understand this as believers and accept this from the sovereign hand of the Lord. However, unbelievers see this as a God who is an evil so-and-so who would bring such devastation. How do you respond to unbelievers? To say, “We do not know the answers”, could be cause for them to not believe in this kind of God – become agnostic or atheistic towards him. What is your response to Aussies who say, “Your God doesn’t give a damn about ordinary people. Look what he has done with the floods at Chinchilla, Dalby, Theodore, Rockhampton, Bundaberg, Maryborough and Gympie. He’s a monster”. To say, “Go to the Book of Job and you will see that we do not know”, is hardly a satisfactory answer to questioning Aussies who want to know the nature of this horrific God who would do this to people. What if Mother Nature’s fury is the curse? If there is no God and the devastating floods that are happening in Queensland are due to the inanimate Mother Nature, why are we bad-mouthing Mother Nature? Qld premier, Anna Bligh, has stated that “Mother Nature is unleashing something shocking” in the Toowoomba disaster. If this devastation is to be blamed on Mother Nature, whatever he, she or it might be, if there is no God then why is she and others griping about these things? If God is not in charge of these things, then he must be just as frustrated as we are. Surely, the floods in Qld should be pointing us to a higher purpose in life than what we are acknowledging. I haven’t heard or read this kind of response: “We have been ignoring God, kicking Him out of our lives for so long. It’s about time He got our attention to focus on ultimate issues in life”. God has promised that he will not strike the earth again like he did in Noah’s day (see Genesis 8:21). Jesus Christ warned us that before Christ’s second coming there would be strange signs in the sun, moon and stars, along with roaring seas and strange tides. People would be terrified by what they see on the earth (see Luke 21:25-28). If there is no God who sends the rain on the just and the unjust, why are we kicking up such a stink about the actions of Mother Nature? These floods should be a wake-up call about ultimate issues for all, not just Queenslanders. This kind of a response to a “Mother Nature” cause, will not be appreciated by those who interpret life emotionally. Exactly 1 year ago March 11, 2010…The exact day of the 9.0 earthquake in Japan hit a year later in 2011. Remember, America forced Israel to remove 8,000 Israeli’s from their homes in Gaza, then came Katrina where America lost 800,000 houses in Louisiana, Mississippi, Alabama. Japan demanded that Israel not build 1,600 housing units in east Jerusalem. After the 9.0 earthquake Japan may have to rebuild 1.6 million homes. God is not mocked! Pay attention America! What are we to make of those who want to link Japan’s actions (sins?) against Israel with the earthquake and tsunami that hit Japan on 11th March 2011? There were some present at that very time who told him about the Galileans whose blood Pilate had mingled with their sacrifices. And he answered them, “Do you think that these Galileans were worse sinners than all the other Galileans, because they suffered in this way? No, I tell you; but unless you repent, you will all likewise perish. Or those eighteen on whom the tower in Siloam fell and killed them: do you think that they were worse offenders than all the others who lived in Jerusalem? No, I tell you; but unless you repent, you will all likewise perish” (ESV). To paraphrase Jesus for Aussies today, based on Luke 13:1-5: There are people present today who speak about the Japanese who denounced Israel one year before the tsunami. Jesus answers these who see this as judgment against Japan: “Do you think that these Japanese are worse sinners than all Australians because they acted in this way? No, says Jesus. I tell you: but unless you repent, you will all likewise perish”. We do not have the right to pronounce that the earthquake, tsunami and the nuclear meltdown are God’s judgment on Japan – based on Luke 13:1-5. Providing judgment is God’s job and he will do it in our time. God has told us (Luke 14) that we all are sinners who need to repent and the Japanese crisis should be a reminder that all sinners need to repent. I learned this when I was studying Jim Kennedy’s gospel presentation in Evangelism Explosion. Often as you begin presenting the gospel, the person will say something like, “I don’t believe the Bible. You’ll have to convince me some other way than referring to the Scriptures.” Many people are devastated by this objection. What happens to them? Their attempt to share Christ fizzles. This need not be the case. I want to encourage you to use this objection as a springboard into the gospel itself. The Apostle Paul, when he preached in Greek cities that had no background in the Bible, appealed to the Scriptures even though the people who listened to him did not believe the Bible. He proclaimed to them and the Holy Spirit used the proclamation to save some who then came to believe the Bible to be true. When we witness, our primary function is to proclaim the gospel, not defence of the Bible. BUT when people object to the Bible, we DO NEED good answers to respond. And there ARE EXCELLENT answers. The judo technique works like this. The objection, “I don’t believe the Bible,” is quite an easy one to deal with. Don’t use the approach of a boxer who meets the blow head on and tries to overwhelm the opponent with counter punches. Instead use the technique of the judo expert. The force of the opponent’s blow is used to throw the opponent. Here’s how it works in presenting the gospel. The person who objects, “I don’t believe the Bible,” usually has some university education, or has been exposed to some course in the Bible, or biblical criticism or something like that. There is often some intellectual pride that says or infers something like this: “I used to believe those fairy tales when I was in kindy, but now I am an educated person and am far above believing those things.” It is this intellectual pride that can be used to turn this objection into an opportunity for presenting the gospel. I suggest this kind of dialogue with the person who objects. “You don’t believe the Bible, John? That’s very interesting and it certainly is your privilege not to believe it, and I would fight for that right on your part. However, if the Bible is true then obviously you must accept the consequences. My experience is that over 90% will respond by saying that it is by keeping the Ten Commandments or following the Golden Rule or imitating the example of Christ, doing good, or something like that. Now the tables have been completely turned. Instead of being superior to the Scripture and even above listening to it, he now finds himself ignorant of even its basic message. Now he must decide whether to listen to the message of the Scriptures or be found to be not only ignorant but also some obscure person who opposes intellectual advancement — and wants to remain in his ignorance. This is the last thing in the world that his intellectual pride will allow him to be. So, very often he will give you permission to tell him the gospel. It is at this point that you pray with vigour that the Holy Spirit will take the gospel, which is the power of God to salvation, and use it to awaken him from the deadness because of sin. God is sovereign. As the Creator of all things visible and invisible, He is the owner of all, has an absolute right to rule over all, and He exercises this authority in the universe (Henry C. Thiessen 1949:173). See: 1 Chronicles 29:11; Psalm 115:3; Isaiah 45:9; Ezekiel 18:4; Daniel 4:35; Matthew 20:15; Romans 9:14-24; 11:36; Ephesians 1;11; 1 Timothy 6:15; Revelation 4:11. Copyright © 2016 Spencer D. Gear. This document last updated at Date: 20 June 2016. This entry was posted in Problem of evil, Sin on 24 February 2015 by spencer. What is the New Testament view of women in ministry? 1 Corinthians 14:26 permits open ministry by both men and women: ‘Well, my brothers and sisters, let’s summarize. When you meet together, one will sing, another will teach, another will tell some special revelation God has given, one will speak in tongues, and another will interpret what is said. But everything that is done must strengthen all of you’ (NLT). So such ministry is available to ‘brothers and sisters’. But when Paul wrote to Timothy (who was in Ephesus) he said: ‘I do not let women teach men or have authority over them. Let them listen quietly’ (1 Tim 2:12 NLT). Women are not to teach men and have authority over them seems to be the clear teaching of this verse. Is Paul confused and contradictory or is there something else going on here? We do know from Acts 2:17 what happened on the Day of Pentecost with the outpouring of the Holy Spirit: “‘In the last days,” God says, “I will pour out my Spirit upon all people. Your sons and daughters will prophesy. Your young men will see visions, and your old men will dream dreams”’ (NLT). There will be ministry, including prophecy, for both men and women. Galatians 3:28 confirms that there is no sectarianism in Christianity, ‘There is no longer Jew or Gentile, slave or free, male and female. For you are all one in Christ Jesus’ (NLT). How do these Scriptures play out with leading Bible teachers of today? Let’s check two of them who take opposing views. N T Wright, a prominent evangelical exegete and historian of Christian origins from the UK, wrote about women in ministry: ‘I believe we have seriously misread the relevant passages in the New Testament, no doubt not least through a long process of assumption, tradition, and all kinds of post-biblical and sub-biblical attitudes that have crept in to Christianity’ (Wright 2004). ‘Women may be highly gifted teachers and leaders, but those gifts are not to be exercised over men in the context of the church. That is true not because women are spiritually inferior to men but because God’s law commands it. He has ordained order in His creation—an order that reflects His own nature and therefore should be reflected in His church. Anyone ignoring or rejecting God’s order, then, weakens the church and dishonors Him’ (MacArthur 2013). So which is it? Are women open to any ministry in the church or are they restricted so that they cannot exercise authority over men and this includes preaching to men? Could the tradition against women having authority over men (including preaching to them) be labelled as the orthodox view? Is the pro-women in ministry perspective, advocated by N T Wright and this writer, the heterodox (heretical) perspective? Watch the argumentation that follows. Here in Brisbane my wife and I attend a church with solid expository preaching but the services are ho-hum boring. They could easily send me to sleep. The pastor does not know how to get and retain people’s attention with his teaching (he preaches through books of the Bible). As for the reason for this, thank Bill Hybels, Rick Warren and the seeker-sensitive marketing approach. I engaged in an email exchange with a pastor of such a church locally and he told me that I would find his church too contemporary. I visited once. It is not that being modern is the problem; it’s the lack of biblical content. There was no Bible reading in the entire service and to call the topical ditty a sermon is to redefine the word. My nephew and his family attend one such church in my suburb of another denomination and his 8-year-old son told me, ‘We get a concert every week’. Turning it around will take a revival, I believe. But then the comments took a different turn. This is how the provocative juices got started with one woman’s comment, ‘I can’t find one in Brisbane also. It grieves me’. Another woman’s response was: ‘Hi Sharon, Here are the details of a biblically solid church in Brisbane. I highly recommend them www.mcc777australia.org/mcca_brisbane_102.html’. Thanks Ella for the link. When I clicked on it, it appears that there is a woman pastor. Is that correct? If so, that is a heresy and one of the main reasons why it is difficult to find a church that will actually preach what the bible teaches. Have a look at your bible, at the biblical role of women and who is allowed to teach in a church meeting. I too had to have an education by the HS [Holy Spirit] on this topic. It led to a lot of repentance on my behalf. So, according to this person, to be a woman pastor is to commit ‘heresy’ and her anti-heresy, traditional view, comes from ‘an education by the Holy Spirit’. However, there was no definition of heresy provided and how pro-women in ministry is heresy. Gerhard Nordholt’s summary of the New Testament Greek understanding was that in 1 Corinthians there is a distinction between haireseis and schismata. While schismata split the church through personally motivated disputes, there is an eschatological dimension added by the haireseis. ‘Haireseis are the results of the schismata’ and, according to 2 Peter 2:1, the activities of false teachers lead to haireseis. Passages such as Titus 3:10, Matthew 18:15-20 and 2 John 10 demonstrate how to deal with heretics (Nordholt 1975:534-535). Thus, in New Testament times, the Christian understanding of heresy was that it referred to: (1) Dissensions and destructive opinions that were, (2) Contrary to the teachings of the ekkl?sia; (3) Schisms led to heresies; (4) Thus, haireseis (plural) had an eschatological-dogmatic dimension that attacked the church’s foundational doctrines. Here dogmatic refers to doctrines that are officially and authoritatively confirmed. (5) Therefore, in the New Testament, the standard by which to assess hairesis (singular) is the content of the Scriptures. Those in the Roman Catholic and Orthodox Church tradition would include Tradition and Scripture as standards for judging heretical doctrines (see Wilhelm 1910). Evans stated that this evolution of the understanding of the meaning of ‘heresy’ underlies many of the difficulties she discussed in her study. In the early years of the Christian church these heresies included those dealing with issues imported from ancient philosophy (including allegorical interpretation and the nature of the Trinity), the incarnation, Christology (including the God-man relationship of Jesus), dualism (evil versus good), ministerial succession of the Catholic church, discounting the need for divine assistance in salvation (Pelagianism), the Easter controversy, transubstantiation, the Iconoclast controversy, separation over confessional identity, heresies associated with a prominent figure or hierarchies (examples being Marcionites, Arianism, Pelagianism), and the Inquisition (Evans 2003:65-89). ”heresy” came to be used to mean a separation or split resulting from a false faith (1 Cor. 11:19; Gal. 5:20). It designated either a doctrine or the party holding the doctrine, a doctrine that was sufficiently intolerable to destroy the unity of the Christian church. In the early church, heresy did not refer to simply any doctrinal disagreement, but to something that seemed to undercut the very basis for Christian existence. Practically speaking, heresy involved the doctrine of God and the doctrine of Christ – later called “special theology” and “Christology” (Brown 1984:2-3). So some kind of skirmish or division (schismata), whether that be over baptism, the nature of the Lord’s supper, eschatological differences, or women in ministry would not be regarded as heresy in the early church. Hi Spencer, I have heard it all before and I still disagree because there are quite a few holes in his arguments. I have written extensively on this in my blog but if you want an expert, have a listen to David Pawson. As for me, like many Christian woman (sic), I embrace biblical womanhood and throughly (sic) enjoy it for what it is. I fasted and prayed over this issue for 3 years before it all became clear. Never been happier. I will still call it heresy. You have to do biblical gymnastics to make the other way make sense. Most men I know have never really fasted or prayed over it – maybe because it doesn’t really effect their obedience to the Lord. The women I know who have… they seem to end up at the same position as myself. Before getting into an examination of Sharon’s approach, it is important to examine the place of logic in the life of a Christian believer. Did God invent logic or is it from some secular source? Norman Geisler & Ronald Brooks present some challenging material in their publication, Come Let Us Reason (Geisler & Brooks 1990). Brooks tells of his first logic teacher, Howard Schoof, whose exhortation was, ‘The next best thing besides godliness for a Christian is logic’. Brooks’ comment was, ‘Clean living and correct thinking make a potent combination’ (Geisler & Brooks 1990:7). Simply put, you can’t avoid studying logic, so you might as well know what you’re doing. It is the basis of all other studies. It is the basis for all math and science. Even music, from Bach to the Beach Boys, is based on logic. Without it, there could be no rational discussion of anything; writing would be impossible. How can you put a sentence together without a logical order?… The only way to avoid logic is to quit thinking, because logic is the basis of all thought (Geisler & Brooks 1990:11, 13, emphasis in original). So, what happens when a person uses logical fallacies? 1. ‘I have heard it all before and I still disagree because there are quite a few holes in his arguments’. There is not one specific example given here but generalisations of ‘heard it all before’ and ‘quite a few holes in his arguments’. This is committing a question begging logical fallacy. This is fallacious logic because simply assuming that the conclusion is true (directly or indirectly) – hearing it all before and holes in the argument – does not provide evidence for the conclusion that rejects women in pastoral ministry. Here the assumption is made that hearing it all before and the alleged holes in the arguments are evidence to support her view. This is not true when no evidence has been provided. She appealed to generalities and did not deal with the specifics from N T Wright’s article that was pro-women in ministry. She failed to give her biblical reasons. 2. ‘As for me, like many Christian woman (sic), I embrace biblical womanhood and throughly (sic) enjoy it for what it is’. This commits an ‘appeal to belief’ logical fallacy. As this link demonstrates, ‘This line of “reasoning” is fallacious because the fact that many people believe a claim does not, in general, serve as evidence that the claim is true’. Sharon’s appeal to ‘many Christian women’ to demonstrate her point is a pointless argument since she has not demonstrated her case or rebutted N T Wright’s pro-women position. However, to be fair to her, doing this on another person’s blog is nigh impossible. She could have said something like, ‘I disagree with these points made by Wright. Here are some links to my and other articles where I address these’. Her statement, ‘I embrace biblical womanhood’. So who defines ‘biblical womanhood’? Sharon does, and her following comments tell us from where she obtained this understanding. So who is correct? N T Wright, Sharon Stay, Spencer Gear or David Pawson? Sharon’s statement seems to commit the ‘appeal to authority’ logical fallacy. 3. ‘I have written extensively on this in my blog but if you want an expert, have a listen to David Pawson’. Now she has committed the appeal to authority logical fallacy as she has written extensively about this topic on her blog. So is she a specialist in defining ‘biblical womanhood’ and how it ought to function in the church? Then she appeals to the ‘expert’, David Pawson. However, she gives no link to or statement about where I would find his exposition on women in ministry. Why would David Pawson’s exposition be any more authoritative and exact in biblical terms and exposition than that of N T Wright? 4. ‘I fasted and prayed over this issue for 3 years before it all became clear. Never been happier’. My response to her was: ‘We can’t have a logical conversation when you generalise like this, present yours as the elevated spiritual position (prayer and fasting), and denigrate men as not complying with your spirituality’. This commits another logical fallacy, appeal to consequences of a belief. It is an erroneous line of reasoning because the consequences of belief that come after prayer and fasting do not tell us whether the belief is true or false. That decision needs to be reached by an examination of the biblical text. This controversy over women in ministry would not have arisen if it were not for differing interpretations of the biblical text. So, it’s an issue of hermeneutics, not whether one prays and fasts over this issue. 5. ‘I will still call it heresy. You have to do biblical gymnastics to make the other way make sense’. Here Sharon has committed another logical fallacy, appeal to ridicule. It is false reasoning because mocking a pro-women in ministry position by labelling it as ‘heresy’ does not provide the evidence to demonstrate that it is false. She has not told us what constitutes heresy and how the pro-women view stacks up as heretical theologically. 6. ‘Most men I know have never really fasted or prayed over it – maybe because it doesn’t really effect (sic) their obedience to the Lord. The women I know who have… they seem to end up at the same position as myself’. Here she has committed another logical fallacy, faulty generalisation or leaping to a conclusion. Sharon has committed this fallacy because she has not observed enough men to come to her conclusion. Her statistical sample is from ‘most men I know’. This is not a statistically large enough sample to reach a valid conclusion. This is an unrepresentative sample. Therefore, the reasoning is fallacious. Determining men’s views on women in ministry by using ‘most men I know’ as the sample, is not the way to go about gathering data for one’s position. A better way would be to engage in careful examination (exegesis) of the biblical text. Dr Michael C Labossiere has stated that ‘a fallacy is, very generally, an error in reasoning. This differs from a factual error, which is simply being wrong about the facts. To be more specific, a fallacy is an “argument” in which the premises given for the conclusion do not provide the needed degree of support’ (The Nizkor Project: Fallacies). An objection that could be raised is that to use logic is to use a secular, naturalistic approach and we do not need that with God. To make that kind of statement that opposes God and logic, one has to use logic. ‘Logic is unavoidable…. The Gospel of John begins with the statement, “in the beginning was the Logos.” The basis of all logic is that some statements are true and others are false. If this word about God is not a logical word, then what is it? The whole idea of theology is that rational statements can be made about God. Even someone who says the opposite has just made a rational (although untrue) statement about God. Logic is undeniable’ (Geisler & Brooks 1990:15-16). So to live in reality, where we need to use logic, we understand that God is the God who created logic. After all, Scripture affirms this of Jesus, the Word, ‘All things were made through him, and without him was not any thing made that was made’ (John 1:3 ESV). Therefore, God made logic. He made us with the ability to communicate and that requires the absolute necessity of engaging in logical discussions. What happens when we use logical fallacies? If logic is a way to arrive at correct conclusions or valid inferences, then logical fallacies, whether formal or informal, are mistakes in thinking. A formal fallacy deals with the form of an argument – the way we think. An informal fallacy relates to the meanings of the terms we use. These can be either unclear or misleading or they could be irrelevant to the topic (Geisler & Brooks 1990:13). I highly recommend this publication for a Christian view of logic. 22 to put off your old self, which belongs to your former manner of life and is corrupt through deceitful desires, 23 and to be renewed in the spirit of your minds, 24 and to put on the new self, created after the likeness of God in true righteousness and holiness (Eph 4:22-24 ESV, emphasis added). This is further emphasised in Romans 12:2, ‘Do not be conformed to this world, but be transformed by the renewal of your mind, that by testing you may discern what is the will of God, what is good and acceptable and perfect’ (ESV, emphasis added). The God who created logic is concerned that Christians be transformed by the renewal of the mind. In the context of Eph 4:22-24, that refers to getting rid of the corrupt and deceitful desires of one’s former lifestyle and being renewed by thinking righteous, holy and godly thoughts. However, these are in accordance with logical thinking about God. A logical fallacy is a defect in reasoning. I have heard them by politicians, public speakers (including preachers), and on the internet. When I view Aussie politicians being interviewed on TV, I hear them avoid the journalist’s question to go with ‘the message’, which is what he/she wants to promote. Very often this means changing the topic and not answering the question, which is using a red herring logical fallacy. The media are good at doing this also by pumping a false view of the politician’s view that can be a straw man logical fallacy. This fallacy trumps up a distorted version of the politician’s view, so the journalist is not attacking the politician’s view but a fabricated, journalist-invented version of this. What happens when we use the illogic of logical fallacies? We are using faulty logic to try to make our case, but it amounts to an failure to have a reasonable conversation. We need to call attention to speakers who use this tactic. Know the prominent logical fallacies. The Nizkor Project has listed and explained some of the most prominent ones (based on the work of Dr. Michael C. Labossiere). For those who want a Christian approach, see Geisler & Brooks (1990). I also wasn’t trying to take the elevated view as you call it. I simply stated the facts as I know them – that most christian (sic) men I know have not fasted or prayed on this issue and when I asked them why they believed what they did, they couldn’t give a logical answer that correlates with all that scripture has to say. Most just told me to accept it! When I asked a senior lecturer at Malyon (Baptist Bible College) why he believed in women pastors (he had just preached on this topic but completely ignored Timothy and Corinithians (sic)) he told me that it was because the words of Paul are to be put on a lower level to the words of Jesus. According to him, Paul apparently had it wrong. He must not agree with “all scripture being inspired by God”…I went home and cried that day at the apostasy in the church. So that has been my experience. My husband and I are in agreement on this issue. He leads in our family. I think we all need to keep praying for unity with God on this issue as it seems to me we can’t all be right when our opinions differ so much. That was why I started the prayer and fasting in the first place. It was not to elevate myself into a higher spiritual position. It more like 3 years of weeping and fasting and praying for the church in our nation, agonising over the state it is in. Begging God to reveal truth to me. He did. That’s all. There is a lot more I need to learn but what I have learnt I will share and speak out. After this comment about the Baptist Malyon College in Queensland, I contacted my son who is an MDiv graduate of that college about this senior lecturer at Malyon who devalued the words of Paul. My son’s reply was, ‘John Sweetman [principal of Malyon] has gone on record plenty of times as having a complementarian view of marriage but an egalitarian view of ministry’. Sharon, I agree with you wholeheartedly, however what do you do when the men aren’t there? Isn’t it better to have a woman preacher who speaks the word of God in truth than leaving a vacuum? God is the law maker and sometimes we need to allow that He will work with what He has as in the case of Deborah being the judge of Israel. But of course wherever there is a woman pastor filling the gap our prayer needs to be, “Lord, provide a godly man to take her place”. Thankfully we are in a church where the minister preaches faithfully to the word of God, though I haven’t heard a sermon on Mat 19 in a long time. Thanks Ursula. Deborah is often brought up as a justification for women being pastors. However Deborah though a prophetess, was not the leader of the ‘church’ at the time. Hers was a governmental position – the levitical system was still ruling the ‘church’ or worship, in the line of Aaron. You see the same with Miriam, another prophetess often quoted to justify women overseers of the church. She too was not leading the worship. It remained with the Priestly Levites who were all men. It was the same for all the women prophetesses in the O.T. At no point were the women running the sacrifices etc. In the NT it’s the same – the role of prophetess is outside the role of church leadership. That is why both exist simultaneously. You can have a prophetess and have men leading the church. They are not mutually exclusive as some teach. Many women in NT times, opened their homes for church meetings to be held there, but they did not actually lead the services and oversee the church. The NT is quite clear that a ‘husband of but one wife’ was to oversee the church. Women primarily were to be busy in the home, raising the children and teaching other women how to love their husbands and children. ‘Now Deborah, a prophetess, the wife of Lappidoth, was judging Israel at that time. 5 She used to sit under the palm of Deborah between Ramah and Bethel in the hill country of Ephraim, and the people of Israel came up to her for judgement. 6 She sent and summoned Barak the son of Abinoam from Kedesh-naphtali and said to him, “Has not the Lord, the God of Israel, commanded you, ‘Go, gather your men at Mount Tabor, taking 10,000 from the people of Naphtali and the people of Zebulun’. Therefore, Deborah, the prophetess, most certainly had a leadership role in judging Israel. You state, ‘Many women in NT times, opened their homes for church meetings to be held there, but they did not actually lead the services and oversee the church’. How do you know that? That doesn’t explain the possibility of Junias/Junia being a female apostle (Rom 16:7 NIV). You state that ‘the NT is quite clear that a ‘husband of but one wife’ was to oversee the church. Women primarily were to be busy in the home, raising the children and teaching other women how to love their husbands and children’. Let’s check out how ‘quite clear’ it really is. The elder must be the ‘husband of one wife’ is from 1 Tim 3:2 (KJV, ESV, NASB, NET), but the NIV translates as ‘faithful to his wife’ and the NLT, ‘He must be faithful to his wife’; REB, ‘faithful to his one wife’. The Greek is literally ‘to be of one wife husband’. There could be four different meanings of this statement. The issue in Ephesus (where Timothy was when Paul sent this letter) was promiscuity (marital infidelity and a low view of marriage, see 4:3; 3:4-5) and not polygamy. When we examine the context, Paul is talking about an overseer’s character qualities in 1 Tim 3:2-5. So the meaning leans towards that of the NIV, NLT, REB since they are dynamic equivalence (meaning-for-meaning) translations. 4. ‘It could be that it requires marital fidelity to his one wife (cf. NEB: “faithful to his one wife”)’ (Fee 1988:80, emphasis in original). in this view the overseer is required to live an exemplary married life (marriage is assumed), faithful to his one wife in a culture in which marital infidelity was common, and at times assumed. It would, of course, also rule out polygamy and divorce and remarriage, but it would not necessarily rule out the remarriage of a widower (although that would still not be the Pauline ideal; cf. 1 Cor. 7:8-9, 39-40). Although there is much to be said for either understanding, of the third option, the concern that the church’s leaders live exemplary married lives seems to fit the context best – given the apparently low view of marriage and family held by the false teachers (4:3; cf. 3:4-5) (Fee 1988:80-81, emphasis in original). In my encounter with Sharon (see above), I picked up her use of 6 logical fallacies. Is this a serious issue when she presents so much illogic in her argumentation? It is detrimental because it is impossible to have a logical conversation with a person who uses logical fallacies. When people logical fallacies in speech or writing, I find it is important to draw this to their attention. That’s why I recommend that you get to know major logical fallacies that people use. See the link to the Nizkor Project above. The additional issue for this advocate of silence of women in leadership positions over me is dogmatism about what she claims is her correct view. She claims that the pro-women in ministry view is heresy and of herself she says ‘I embrace biblical womanhood’ (inferring that I don’t). Also, ‘‘I fasted and prayed over this issue for 3 years before it all became clear’, which makes her spiritual exercises superior to those who obtain a view of women in ministry through, say, exegesis of the text. When she complained about men she knows who ‘have never really fasted or prayed over it – maybe because it doesn’t really effect (sic) their obedience to the Lord’, she not only exalts her superior spirituality but also has judged the men’s motivation as it doesn’t affect their obedience to God. This is a strange and condescending emphasis. I have heard Sharon’s kind of view many times down through the years, but her elevation of her own spirituality in arriving at this decision came out of left field for me. Anyone who claims that we need prayer and fasting to arrive at a view of ‘biblical womanhood’ is taking a different tack to the exegesis I’ve encountered on this topic. Sharon has the additional problem that she used the general term of speaking to a senior lecturer at Malyon College and his denigration of Paul, without mentioning who he was and in what circumstances he said this. There is no way for me to check who said this, under what circumstances, and whether that is what he said and believes. Her calling the pro-women in ministry view a heresy is contrary to the view of the church of the first century and its understanding of heresy. As Harold Brown put it, ‘In the early church, heresy did not refer to simply any doctrinal disagreement, but to something that seemed to undercut the very basis for Christian existence’ (Brown 1984:2). Brown, H O J 1984. Heresies: The image of Christ in the mirror of heresy and orthodoxy from the apostles to the present. Garden City, New York: Doubleday & Company, Inc.
Evans, G R 2003. A brief history of heresy. Oxford: Blackwell Publishing. Fee, G D 1988. 1 and 2 Timothy, Titus (New International Biblical Commentary), W Ward Gasque (NT ed). Peabody, Massachusetts: Hendrickson Publishers. Geisler, N L & Brooks, R M 1990. Come let us reason: An introduction to logical thinking. Grand Rapids, Michigan: Baker Book House. MacArthur, J 2013. Can women exercise authority in the church? Grace to You (online), August 29. Available at: http://www.gty.org/blog/B130829/can-women-exercise-authority-in-the-church (Accessed 23 February 2015). Nordholt, G 1975. ??????? ?, in Brown, C (ed) The new international dictionary of New Testament theology, vol 1:A-F, 533-535. Exeter, Devon, U.K.: The Paternoster Press. Wilhelm, J 1910. Heresy. In The Catholic encyclopedia (online), vol 7. New York: Robert Appleton Company. Available at New Advent http://www.newadvent.org/cathen/07256b.htm (Accessed 7 August 2014). Wright, N T 2004. Women’s service in the church: The biblical basis (online). A conference paper for the Symposium, ‘Men, Women and the Church’, St John’s College, Durham, September 4. Available at: http://ntwrightpage.com/Wright_Women_Service_Church.htm (Accessed 23 February 2015). The footnote at this point was, ‘Or teach men or usurp their authority’. The footnote was, ‘Greek Jew or Greek’. Ibid., Sharon Stay, 17 February 2015, 8pm. Ibid., Ella Gathercole, 18 February 2015, 7am. Ibid., Sharon Stay, 18 February 2015, 7pm. Wilhelm’s (1910) article on ‘heresy’ is recommended for an insightful assessment of the issues historically and with a practical dimension – even though the article is a century old. Ibid., Spencer Gear, 19 February 2015, 7am. Ibid., Sharon Stay, 19 February 2015, 8pm. Sharon’s blog is called, ‘He Leads Me’ (Accessed 23 February 2015). David Pawson is a British Bible teacher and author. See: http://davidpawson.org/. N T Wright is a British New Testament scholar, Anglican clergyman. See: http://ntwrightpage.com/. At the time of writing this article, he was Professor of New Testament and Early Christianity at the University of St. Andrews, St. Andrews, Scotland (Accessed 22 February 2015). Spencer Gear, loc cit, 20 February 2015, 10am. Sharon Stay, loc cit, 20 February 2015, 7pm. Ibid., Ursula Bennett, 20 February 2015, 9am. Ibid., Sharon Stay, 23 February 2015, 7am. Ibid., Spencer Gear, 23 February 2015, 1pm. This entry was posted in Logic, Logical fallacies, Women in Ministry on 23 February 2015 by spencer. They don’t give a journalistic hoot about persecuted Christians! The Bible Society Australia has drawn attention to this absence of reporting Christian persecution by publishing this article by Patrick Sookhdeo in which he stated: ‘In a world where mainstream media largely ignore the plight of Christians, we must make sure we stay informed. We must advocate politically for believers in need, and we must share with them the material blessings God has given us. Above all, we must pray continually (1 Thess 5:17)’ (‘A prayer for the persecuted church’, 28 December 2013). Could you imagine the following newsworthy story appearing without Christians contacting a secular newspaper or news outlet here in Australia (my home country) or in the country where you live? What will it take to get the news media to quit their biases against reporting the abuse that is happening to Christian minorities worldwide? What about this travesty of justice? A Buddhist monk visiting the predominantly Christian Borang village in Nepal’s Dhading district forced all the Christian villagers to convert to Buddhism and ordered them to stop all Christian worship. Two of the church’s leaders refused to obey the orders and were attacked in response. Commissioned by a political leader from the RPP Hindu nationalist party, a Buddhist monk came to the village to preach Buddhism. All of the Christian villagers were locked inside a hall and forced to listen to the Buddhist teachings and to accept Buddhism. They were asked to bow down before a statue, go around the village carrying Buddhist scriptures on their heads, and to place Buddhist flags on their houses. Refusing to obey the orders, the pastor and elder of the church were attacked. Although the church elder managed to escape, the pastor was captured and beaten for three days. He was then forced to place his finger print on a document stating that he would stop running the church and that he would not report the incident to police authorities or leave the village. Led by the Buddhist monk, a group of assailants attacked the church on 1 February. They destroyed the furniture and church building and tried to set fire to it. They also attacked the pastor’s home, cutting off the electricity and phone lines. Not allowed to use the phone or leave the village, the pastor is still in Borang. Local Christians told Barnabas Fund today that they are particularly concerned about the health of the church pastor since there is no information about his current condition. The church was unable to meet the following Saturday, the normal day for worship services across Nepal. Although local police were sent from Setung to the village to find out what happened, the locals, under pressure from the attackers, reported that there had been no problems. The police then returned to Setung without reporting the incident. Although Nepal is over 80% Hindu, Buddhism holds close ties to the majority religion; the birthplace of its founder is said to be in Lumbini, southern Nepal. Dhading district, however, has the highest number of Nepali Christians, with some villages almost entirely Christian. Can you imagine that kind of story appearing in our Australian secular media without a Christian prompt? I’ve been so concerned at this lack of coverage that on 23 January 2015, I sent this letter via email to the editor of the Brisbane Times . I read the Brisbane Times online every morning and I’ve read plenty about the Charlie Hebdo magazine terrorism and the killing of 12 people in Paris. But I’ve not heard the same kind of news coverage about what else is happening in other countries as a result of the Charlie Hebdo cartoon of Muhammad. It could be that I have missed your coverage because I could miss some of your news stories. However, could it be that Zinder and Niamey, cities in Niger, are not as large on the news radar as Paris? However, I think it’s time that you gave extensive coverage to the violence that is happening in other countries as a result of the Charlie Hebdo cartoon. Here is but one example that has reached me via email. In two days of targeted riots that began on 16 January 2015, violence across the northern African country of Niger has left ten people dead and over 70 churches are reported to have been destroyed. The rioters were protesting against the publication of a cartoon of Muhammad on the front cover of the French Charlie Hebdo magazine in France. More riots and protests occurred across many Muslim-majority countries, including many former French colonies. Following Friday prayers on 16 January, hundreds of mainly young Muslim extremists took to the streets in Zinder, Niger’s second largest city, burning and destroying all of the city’s churches, as well as the homes of Christians. The next day, more than 55 churches, pastors’ homes, Christian schools and Christian organisations were burned or destroyed in the capital city, Niamey, as rioters targeted Christians and French-related businesses. Ten people have been killed in the weekend attacks, one of whom was burned inside a church. And more than 200 Christian families are now being housed in military camps. The army has been deployed and the homes of Christians have been identified and secured. With the authorities overwhelmed by the scale of the violence, Christians have been told to stay together, just in case. I also gave him the phone and fax numbers and the email address. Perhaps it is not surprising that I did not receive a response to this email from the editor and a search by Google has not found any of my letter published online. Reporting of the persecution of Christians around the world does not seem to be a favourite topic for the secular media. The world has stood by and looked on. Leaders have condemned but procrastinated. Now the call is to arms: to bomb, to obliterate the Islamic State. But what of the Christian community? They have met with much sympathy. Many politicians and media commentators have expressed their concern for Christians, but still no decisive action has been taken to save them. The real problem is that the Christians have no power, and because of this they are deemed irrelevant. They have no weapons, therefore they are deemed to be no threat. They have no oil, so they have no economic weight. For some politicians it seems better that the Christians should leave the Middle East, for then at least they would not be a complication in the situation. Both sides face hard choices if further slaughter is to be prevented, an outspoken Anglican cleric and authority on radical jihadists tells Tony Parkinson. According to Patrick Sookhdeo, it is time for plain speaking. If the world is not to become a sectarian slaughterhouse, Western and Islamic societies need to address with honesty the hard choices they face. “I think the West has made a strategic mistake in seeking to distinguish al-Qaeda and Osama bin Laden from the rest of Islam, by arguing they are extremists, and therefore cannot be authentic Muslims,” he says. “This is highly questionable. “Bin Laden and his people come from an Islamic tradition where jihad is a cardinal principle in the fight against unbelievers. The fact is they have had tremendous backing from Muslims worldwide, many of whom regard bin Laden as a hero. Sookhdeo is an Anglican clergyman based in Britain. He is also an international authority on jihadist ideology, a former Muslim, an author and a lecturer to British and NATO military officers on radical Islam. With many Muslims claiming their religion is being distorted by terrorists and the West, some of his views are controversial, or easily distorted. But during a visit to Australia this week, Sookhdeo insisted that honest dialogue was essential and the need for change urgent. Modern Muslim societies must rethink the more literal interpretations of the Koran, he argues, particularly the elevation of the 7th century edicts of Muhammad at Medina over the prophet’s earlier and more peaceable revelations at Mecca. What about the Christian community? What will it take for Christian leaders to get off their procrastinating backside and act to deal with what is happening to the Christian communities that are being persecuted? When will the Australian secular mass media determine that abuse of Christians (persecution) cannot be tolerated any longer and that they will expose this abuse whenever possible, whether it is in Niger, Pakistan, India or Kenya? Patrick Sookhdeo, ‘Yes, I criticise certain aspects of Islam, but don’t call me a bigot’ (The Guardian, 27 October 2011). ‘Plight of Middle Eastern Christians’, Rebecca Armstrong, ABC North West Queensland’ (17 October 2013). Patrick Sookhdeo, ‘The myth of moderate Islam’ (The Spectator, 30 July 2005). ‘Western procrastination could put Iraqi Christian lives at risk: comparable with 1939 Jewish refugee refusal’ (5 Feb 2015). How many of you have contacted your local federal MP to ask what he or she could do in parliament to deal with the persecution issues in many countries? What could the Department of Foreign Affairs do? Imagine a debate on this issue in the Australian federal parliament? Or am I dreaming? Christian Persecution is certainly a world problem, I do a little bit presenting topics on the Persecuted Church in my church on a monthly basis. The persecution is pandemic and in some countries is genocide, unfortunately our liberal press do very little covering this Human Rights Atrocity, in many ways apathy in the West is a shame. 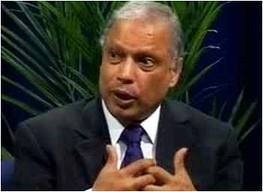 The Situation is similar to the atrocities suffered by the minorities in Europe during the 1930- 1940’s while the West remained quiet (‘Persecution of Christians: Dr Patrick Sookhdeo speaking at Barnabas Fund event in Sydney’, 25 Sept 2012). This entry was posted in Mass media, Persecution on 14 February 2015 by spencer.